The River LINE provides new light rail transit service from Trenton to Camden along the Delaware River. The line runs roughly parallel to Route 130. 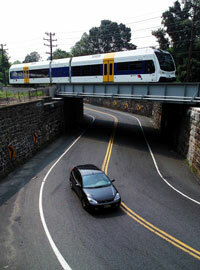 Advanced, diesel light rail vehicles will travel along an existing and enhanced right of way. Light rail offers connections to NJ TRANSIT, Amtrak, SEPTA, and PATCO trains. The River LINE has the potential to enhance the region’s economic development and increase the personal mobility of residents throughout the Route 130 Corridor. In addition to station stops in communities along the Delaware River, the line serves Rutgers University, the Entertainment Center and the State Aquarium. The project was constructed using Design Build Operate and Maintain (DBOM) methodology. NJ TRANSIT contracted with Southern New Jersey Light Rail Group, LLC., in June of 1999. The 34.5-mile system includes 20 stations. A total of 3,300 parking spaces are available. More than 20 bridges were reconstructed along the route and 50 public grade crossings were upgraded. Ground breaking took place in May 2000. The system opened March 14, 2004. River LINE provides advanced transit service to the towns along the Delaware River and will spur economic development in the region.